Last weekend Greg and his lovely wife, Linda, came for a holiday weekend visit to which we all ate and drank to excess and caught up on our sleep. Greg and I also took the requisite time to game like men possessed. On top of a suitably bloody game of SAGA, and reacquainting ourselves with 'Conflict of Heroes' we also played a cataclysmic 'Spearhead' scenario set in the opening hours of Kursk. These were all great fun, but undoubtedly the main event was our Napoleonic scenario based on the French attack on the Allied center at Austerlitz in December 1805. 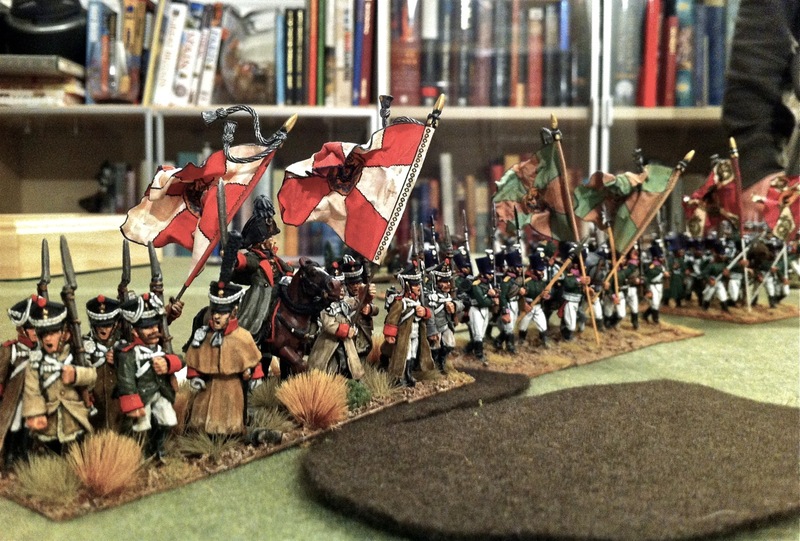 Scott Bowden's 'Napoleon and Austerlitz' describes the Austrian and Russian contingents as separate actions even though they occurred very close to one another on the Pratzen Heights. I think much of this had to do with both the difficulty of communication between the Austrian and Russian partners along with the fact that the Allies wanted to cover-off as much of the heights as possible. Nonetheless, what if the Allies had drawn themselves closer together to better support one another, would it have helped? 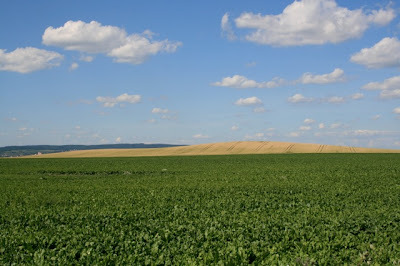 Bowden further describes that the two Allied contingents did not make good use of the available ground, which had several vineyards below the summit (thus the name 'Vinohrady'). These would have slowed down infantry attacks and pretty much nullified threats from cavalry. Historically the Allies deployed well back from the vineyards, surrendering their advantages to the French light infantry. So what if the Allies had positioned their forces to take better advantage of the available ground, could it have aided their defence of the heights? In David Chandler's 'Austerlitz, 1805' he obliquely mentions another unit of Kolowrat's command, Infantry Regiment #24, being in support of IR#23. Reportedly this was a depot battalion of around 400 conscripts, but I reasoned that every man would have helped to spread out the line on the Heights and so included them in my Order of Battle. 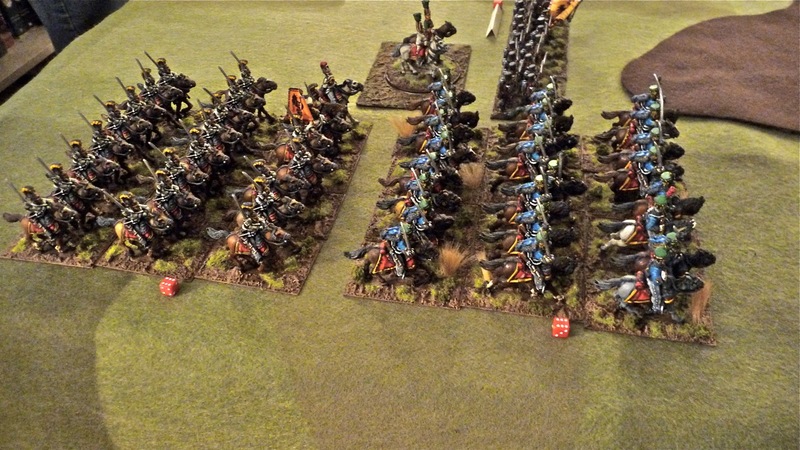 I also added cavalry support to both sides. 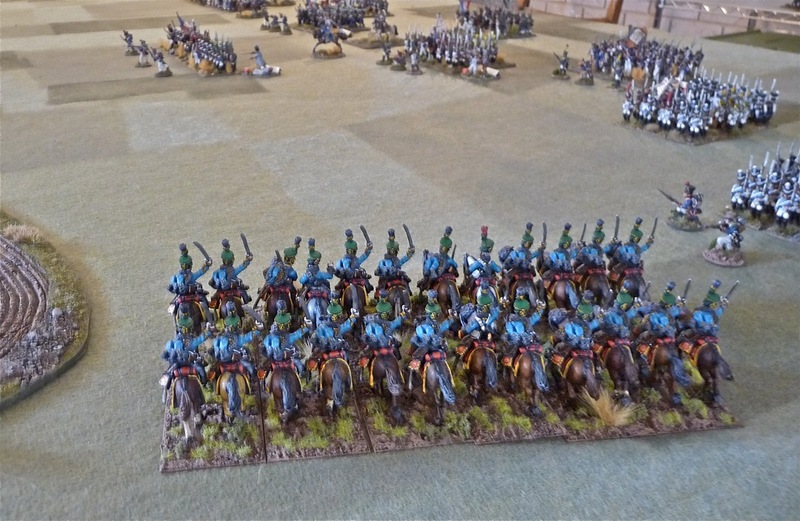 The French had access to Boye's Dragoon brigade (which was historically on-hand) and the Allies now have two regiments (Dragoons and Hussars) originally from Liechtenstein's V Column of cavalry and Wodiansky's Advance Guard. So, finally, what if the Allied High Command had released more cavalry assets to the defence of the Heights? So for our scenario I incorporated the above conjectures and worked with the hypothesis that Kolowrat and Miloradovich have decided to concentrate and coordinate their efforts thereby bringing their forces together - forcing Vandamme to engage them as a combined force on the summit, on advantageous ground of their choosing. A map of the rough dispositions of the two armies as seen at the start of the action. For our game we used our home-grown rules, 'Food for Powder', which do a very good job of reflecting unbalanced engagements. 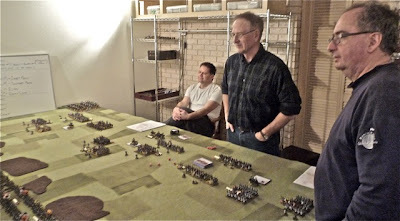 This battle was actually fairly large for a battalion-level game (24 battalions, 4 regiments of cavalry and 3 batteries of guns) so we played it on a 6x10 surface to give us enough room to maneuver. Some may notice that I did not model the Heights on the tabletop - in my reading it seemed to suggest that the path Vandamme took on his assault was along a very gradual slope and therefore would not have granted much tactical superiority to the Allies so I decided to leave out modeling the Heights for sake of clarity. The Stare Vinohrady today as seen from Vandamme's initial positions. For our battle we had John and Dan on the French side, while Greg and Sylvain ran the Austrians and Russians respectively. Here the French commanders, Dan and John, look on with Stacy (on the right) assisting as umpire. Greg and Sylvain commanded the Austro-Russian force. 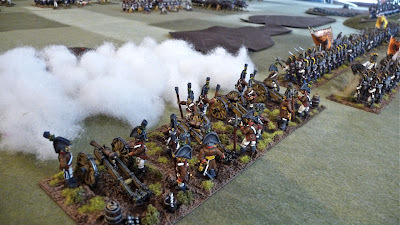 The first turn was fairly quiet, seeing the French move towards the heights along their entire front, including their guns. 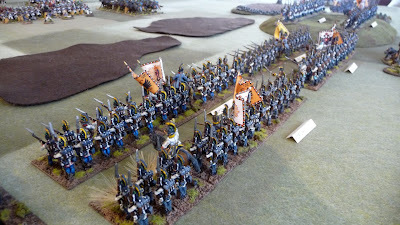 For the Allies, they stayed in place but were very lucky in their reinforcement roll and an composite brigade of cavalry (Austrian Hussars and Dragoons) arrived on their right flank. 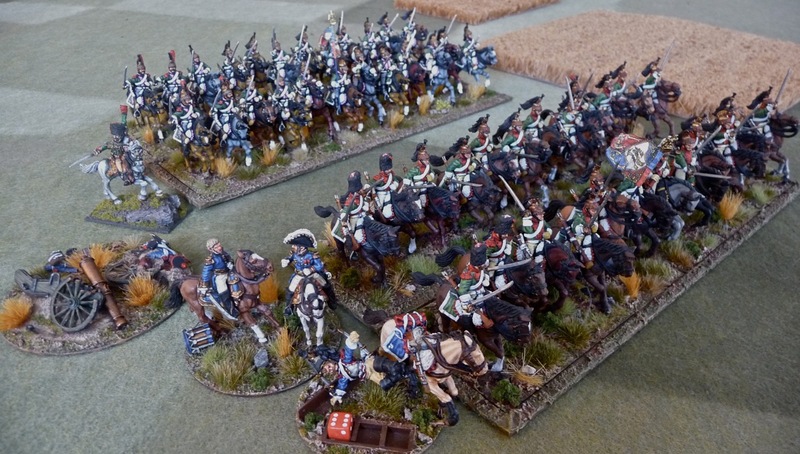 Greg formed them up in column of squadrons, with the Hussars leading and the Dragoons in support. 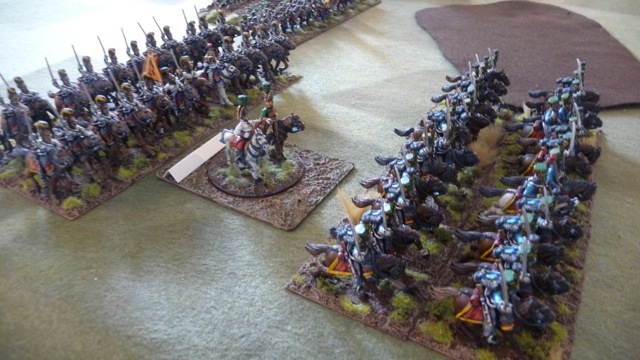 In the second Turn the French brought in their own cavalry in the form of Boye's bigade of Dragoons (under Dan). They deployed on the French right flank, in extended column of squadrons, diagonal to the Austrian cavalry. This choice of deployment had a critical impact in the following turns for both sides as the cavalry had free reign in each of their sectors. Eyebrows were duly raised with this heap of snorting cavalry showing up on the tabletop all at once. Boye's Dragoon Brigade heading towards the Russian line. 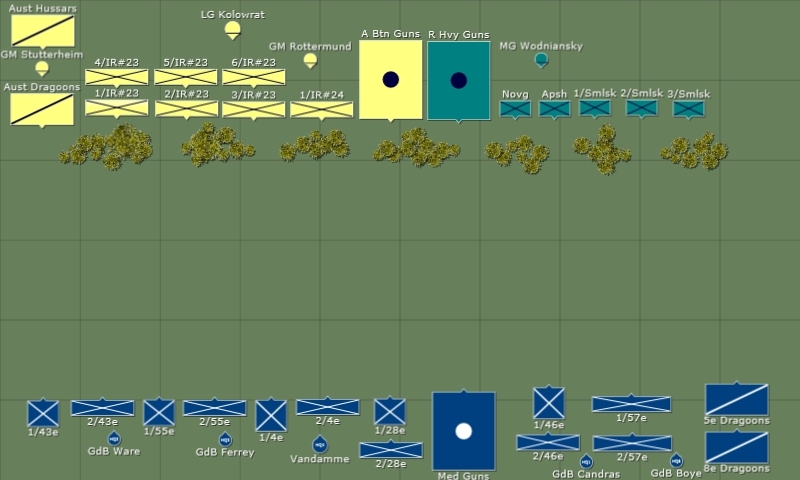 Shown here are three of the five understrength and exhausted Russian battalions that held the Allied left flank. The third turn was a corker. First thing you have to understand that Dan is the antithesis of Sylvain. I like to think of Dan as the General Haig of miniature wargaming. 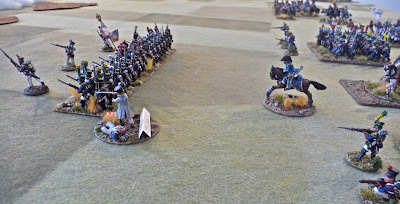 To Dan's way of thinking 'If the first assault does not break them then the twelfth will certainly do the trick...' As such Dan's French Dragoons duly charged the Russian left flank as soon as they got the chance. Since the charge began from a long distance away (practically in Vienna) the Russian battalions had enough time to form squares. 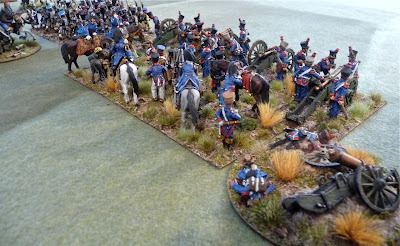 Undeterred, Dan noted that most of the Russian squares were not well-formed (our rules differentiate between 'solid' and 'hasty' squares) and so sent in the leading regiment of Dragoons to see if the Russians would loose their bottle. It was not meant to be. 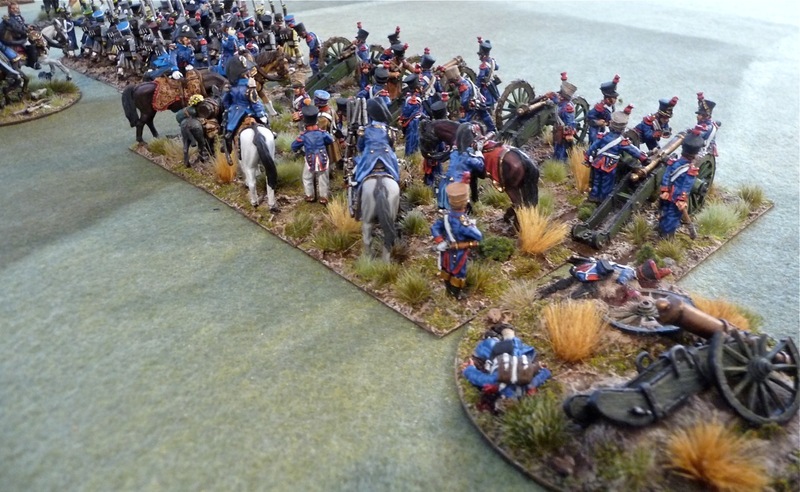 The Russians held their position and repulsed the Dragoons, but not without suffering some casualties and disorder in their ranks. 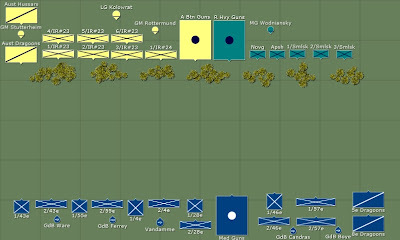 The nervous Austrian line, jammed full of conscripts and raw troops. Meanwhile in the center, one French battalion decided to take the bit by the teeth and move ahead of the advance in line formation... While up the slope the two Allied artillery batteries hammered away at the approaching French columns, who inexplicably neglected to shake-out into less target-rich line formations and so consequently paid the price. 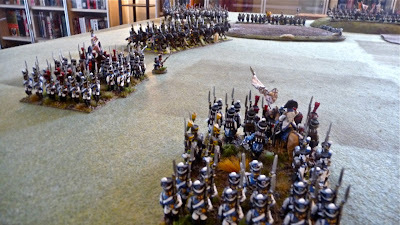 Back to the Allied left, Greg noted the impetuous advance of the solitary French battalion with an arched eyebrow, and thought it was too good of an opportunity for his Austrian Hussars to pass up. Greg knew he'd have to 'roll Vegas' to get the requisite moves in order to close, but he rolled the dice hoping they'd be kind to him. Well, the dice gods were smiling on Austria and Greg managed change formation, sound the charge and head for the French battalion. As John would say later, his battalion 'had the distinct misfortune of being ridden down by the 'flyboys' of the Horse & Musket era'. The only thing that saved the French battalion from complete annihilation was that the Austrian Hussars were at the end of their tether and very fatigued, so the mauled survivors were able to make their escape. 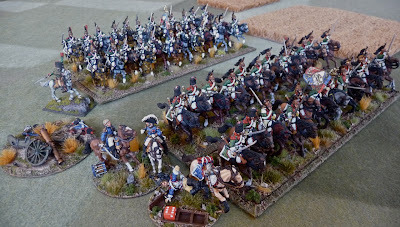 ... but too late - the Hussars are upon them! The unlimbered French artillery ranging in on the Russian squares. 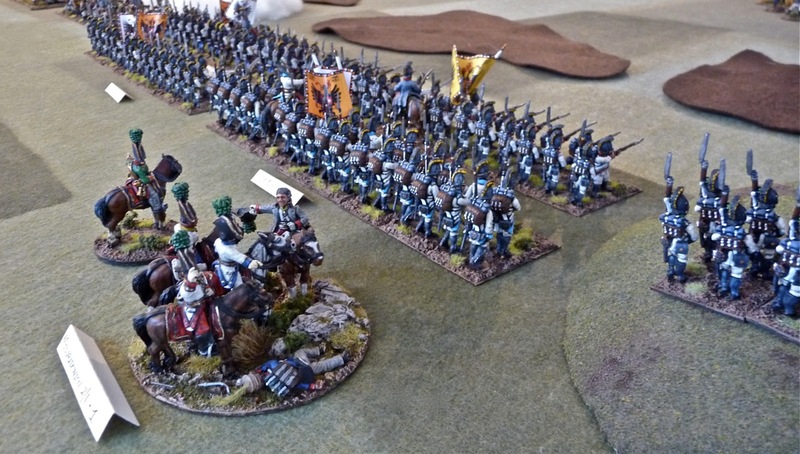 In the center Greg knew his victorious Hussars were desperately exposed and winded so he committed his remaining cavalry, the Dragoons to try to cover their retreat. This turned out to be a little Pyrrhic as the Dragoons were shot to pieces by every French battalion's voltigeurs on their 'Death Ride' to the Hussars' support. Nonetheless, the exhausted 'flyboys' of the game managed to get extricated and began their ride back to Austrian high command to present the French colours they had captured. Kolowrat receiving the news of the capture of a French eagle. I'm sorry I cannot give a final account of the scenario as this is where we decided to break for the evening (we spent a lot of time laughing, eating and drinking.) Nonetheless, we looked over the field at 'halftime' and surmised that while the French had certainly been rebuffed in a few areas they were still in an excellent position on the Allied left flank to start an envelopment with combined arms. The fragile Allied line composed of reduced battalions and conscripts had not yet been truly tested and it would be touch-and-go to tell how it would turn out for them. It was really anybody's game. 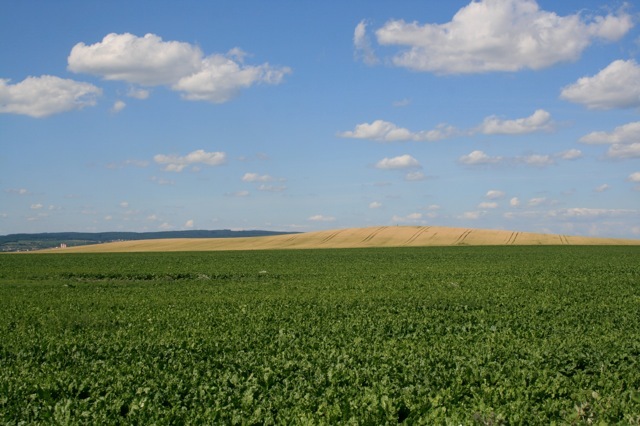 Looking from the French left across the battlefield. 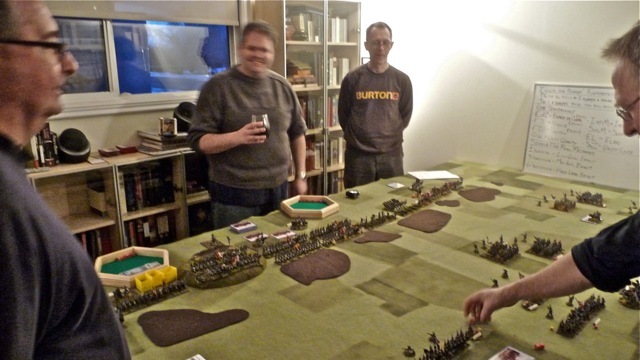 It was great fun, and all of it due to an excellent bunch of guys to game with. I extend my thanks to them all for making the night so entertaining. A special thank you goes to Greg and John who both travelled great distances to attend and brought many beautiful toys from their own collections in order to make the game that much more colourful - bravo!